According to a National Commission report, prices of 152 types of drugs had increased at the rate of 15% every year for over a period of 24 years. And, this is just the tip of the iceberg. Once a patient gets admitted, several different incidental costs keep surging in such as room charge, ambulance charge and make fatal dents in one's personal savings. There is no respite from going through the ordeal and such huge medical expenses might take many years to make up for patients' monetary loss. The situation is bleak and it well and truly triggers the need of comprehensive health insurance policy. But, are Indians armed with a comprehensive health plan to battle out the skyrocketing medical expenses? At the moment, the scenario is utterly gloomy. The latest National Sample Survey reveals that 82% of total urban people and 86% total rural people are flirting with danger of not being covered by any health insurance plan. The survey probed further seeking the reason and confirmed that 55% rural people and 60% urban people are unable to avail health cover due to financial limitation. 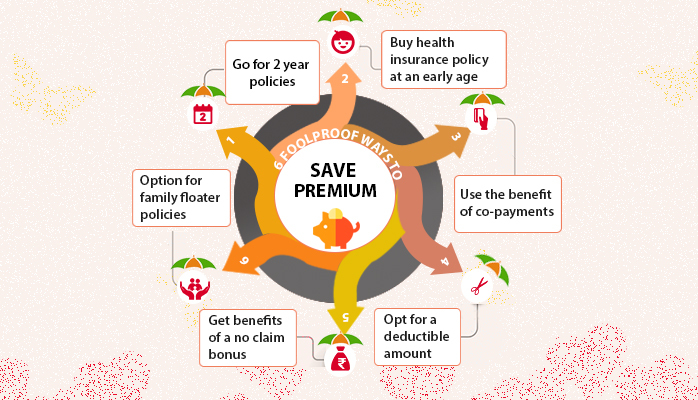 If you fall prey to low-budget and cannot afford a high-end health plans, these 6 insider tips will help you reduce premium of your health policy without compromising on the coverage. Various factors are taken into account to calculate health insurance premium. Age is one of the prime factors and when it increases the premium rises as well. For the same health cover with same features, two people belonging to two different age-group pay varied premiums. Hence, you can save significant amount simply by availing health cover at a young age. An example will make you clear on this. A person in the age-group of 18-34 years pays pays Rs. 5861 for an Optima Restore individual policy (sum insured Rs.3 Lakhs and 1 year tenure). But, the same plan coasts Rs. 6633 for a person in the age-group of 36-44 years. This makes it very evident that if a 34 year old person delays for just two years, he has to pay Rs. 772 more (Rs. 6633 – Rs. 5861). Another great ploy to save on health insurance premium especially if you want to avail protection for your entire family is opting for family floater plan. 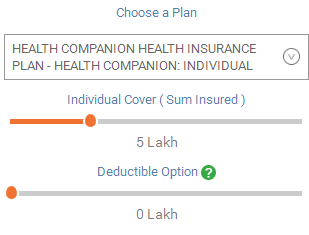 For a family of 4 members (without senior citizens), a family floater health insurance plan proves to be lot cheaper than four individual health plans. If there are senior citizens in the family it is wiser to keep them out of the family floater policy. Instead, you can buy them a separate senior citizen policy. The premium of a family health plan is determined by the age of the most senior member of the family. If the age of the eldest member of a particular family is 35 years the health plan with lowest premium will cost Rs.7166 (sum insured Rs. 5 Lakhs). 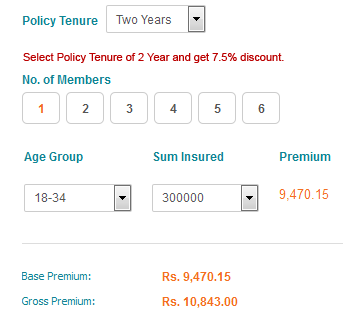 On the other hand, the lowest premium (same sum insured of Rs. 5 Lakhs) for the individual health plans would start from Rs. 3567. For four such health plans, the total premium would cost Rs. 3567 X 4 = Rs. 14,268. So, you can save Rs. 7102 ( Rs. 14268 – Rs. 7166) by opting for family floater health insurance policy. The deductible amount is a part of the health insurance premium and it is chosen by insured people. Up to the chosen amount of deductible insurers are not supposed to pay any amount. By choosing a deductible amount you can also reduce the premium of your health policy. Here is an example to give you clearer idea. Suppose, you want to opt for a health companion individual plan offered by Max Bupa. For Rs. 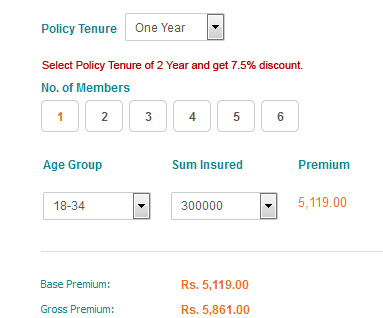 5 Lakh sum insured the premium would be Rs. 6973 for 1 year tenure without opting for any deductible amount. But, if you choose Rs. 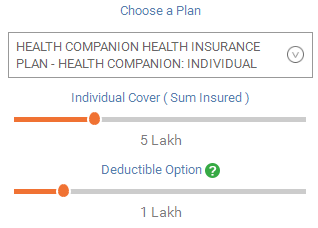 1 Lakh as deductible the premium will reduce to Rs. 5231. So, you can save as much as Rs. 1742 (Rs. 6973 – Rs. 5231) by opting for Rs. 1 Lakh. However, you have to pay Rs. 1 Lakh in case of any claim and your insurer will pay the rest afterwards. Just like the deductible clause, you should also make the most of the co-pay feature. By choosing to pay a percentage of claim amount you can pay reduced premium. At the time of claim settlement, you have to pay your part initially and then your insurer will take care of the rest of the claim amount subsequently. While this applies for health policies with voluntary co-pay, there are also some plans that comes with mandatory co-pay and some plans don't have the option of co-pay at all. For the same sum insured amount, health covers with mandatory co-pay usually come with higher premium rates. By choosing sum insured amount of Rs. 5 Lakhs and 1 year tenure you will get a list of health policies with varied premium. By opting out the co-pay option you can chose among only plans without any co-pay option. The lowest available premium in one of those health policy is Rs. 3567. But if you choose to opt for co-pay, all health covers will come with mandatory co-pay option. The lowest available premium in one of those health policy is Rs. 5260. Nowadays many health insurers offer health policies with two-year tenure and offer discount for picking two-year policies. This feature can also save you a substantial amount of money. The premium is Rs. 5861 for an individual health policy called Optima Restore provided by Apollo Munich with coverage of Rs. 3 Lakhs and 1 year tenure. Had you selected two-year tenure option in the very first year the total premium would be Rs. 10,843 as there is 7.5% discount on offer. A plethora of health insurers reward policyholders for not making any claim. The reward comes in the form of NCB at the time of policy renewal. So, your best bet would be those health plans that come with NCB feature. Typically the percentage of NCB ranges between 5% each year and maximum 50%. Some health insurers also offer Super NCB in the range of 60% to 150% for each claim-free policy year. So, if you stick to a specific health policy for many years without making any claim you will definitely reap the reward in the form of higher NCB which leads to much-reduced premium. The National Commission report shows 75% of total health expenses come from households of the patients and the central, state and local governments look after the rest of 25%. The report further reveals that people on average spend Rs. 25850 for undergoing treatments in private hospitals and Rs.6120 in public hospitals. According to a fatal stat disclosed by World Health Organization, four non-communicable diseases in India in the likes of cancers, chronic respiratory diseases, cardiovascular diseases and diabetes account for the death of 26% of total population in the age-group of 30 - 70 years. Among these four deadly ailments, cancer treatment is the most costly one (Rs. 56712) followed by Cardio-vascular diseases (Rs. 31647). If you don't want to run from pillar to post to arrange money to pay such hopping medical bills securing a health insurance plan with wide coverage would be the way to go. Hopefully, these 6 tips will help you get over your financial constraints and trim your health insurance premium successfully.